For better or for worse, war often drives innovation. World War I, in particular, heralded the introduction of numerous formidable and terrifying technologies: flamethrowers, poison gas, combat aircraft, and tanks, to name a few. 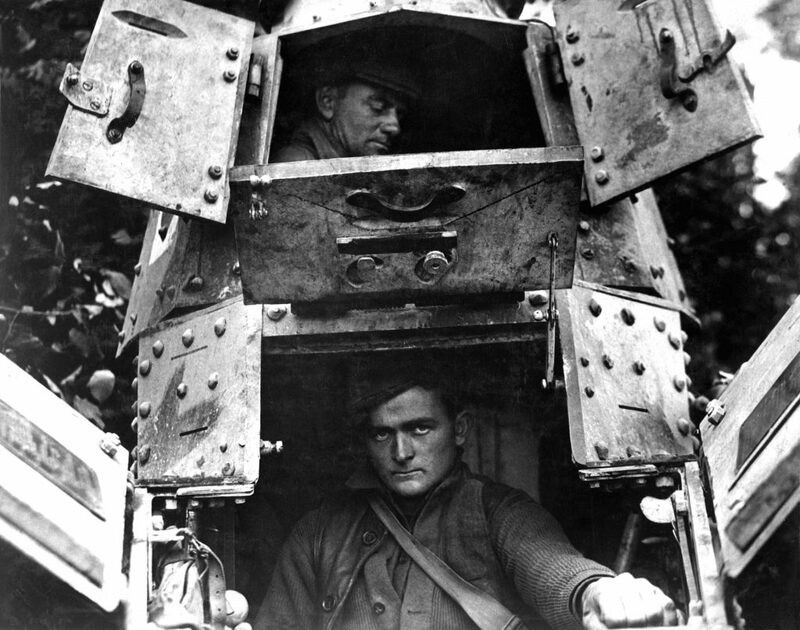 While the idea of an armored vehicle equipped with cannon can be traced as far back as Leonardo De Vinci’s fifteenth century sketches, the production of such a contraption did not occur until necessitated by the stagnation of trench warfare on the Western Front. 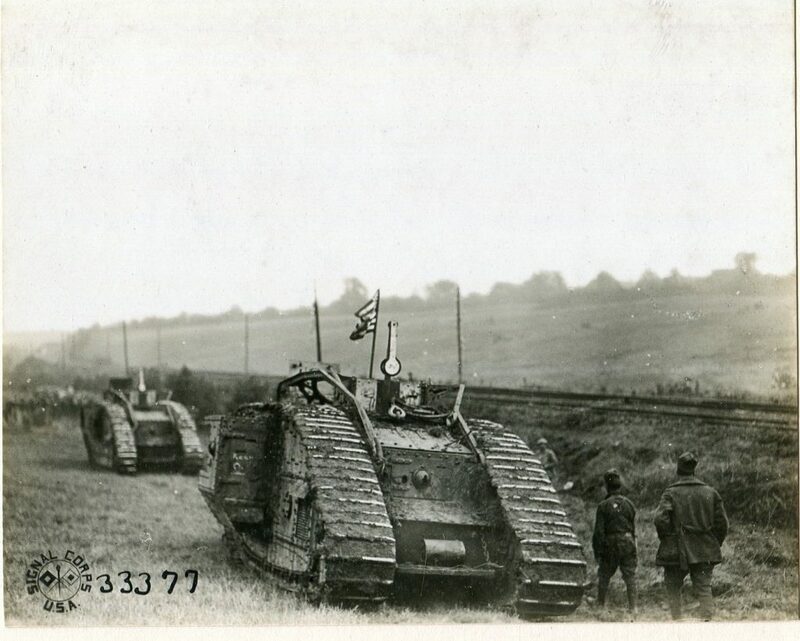 Great Britain and France developed prototypes simultaneously, but the British were the first to deploy their “landships” (as they were referred to in early development) at the Battle of the Somme in 1916. These massive, intimidating, metal hulks debuted to mixed results, as they were prone to mechanical malfunctions and were easily impeded by rough terrain. Nevertheless, their impact was enough to provide hope for an end to the bloodletting in the trenches. After the Somme, Great Britain and France worked at improving the mechanized behemoths. Germany, although on the receiving end of the tanks’ destructive power, remained unconvinced of their worth. It was not until 1918 that the first German tanks, in very limited numbers, appeared on the battlefield. 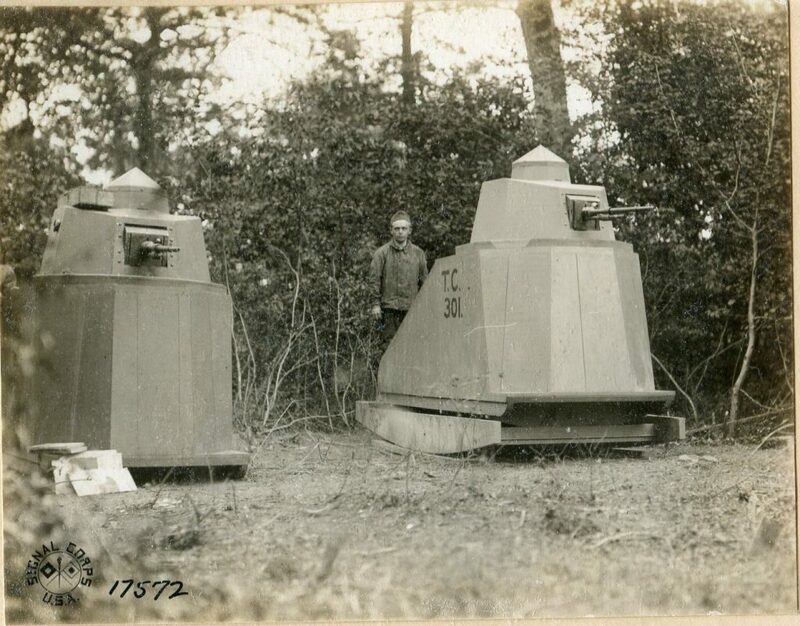 After consulting AEF personnel, Eltinge sent an estimate to the War Department stating that 600 heavy and 1,200 Renault light tanks would be needed by the new department. He further estimated that fifteen percent of the original 1,800 tanks would need to be procured each month in order to adjust for attrition. In terms of manpower, Eltinge estimated that the new take force would require 14,827 men in order to man, repair, and transport the tanks, operate depots, and perform other related duties. In mid-October, Majors Herbert W. Allen and James A. Drain began another study, this time into the production, design, maintenance, and supply of tanks. In the meantime Captain George S. Patton, then serving as post adjutant and commander of the AEF Headquarters Company at Chaumont, was unhappy with his assignment and eager to move on to something more stimulating. 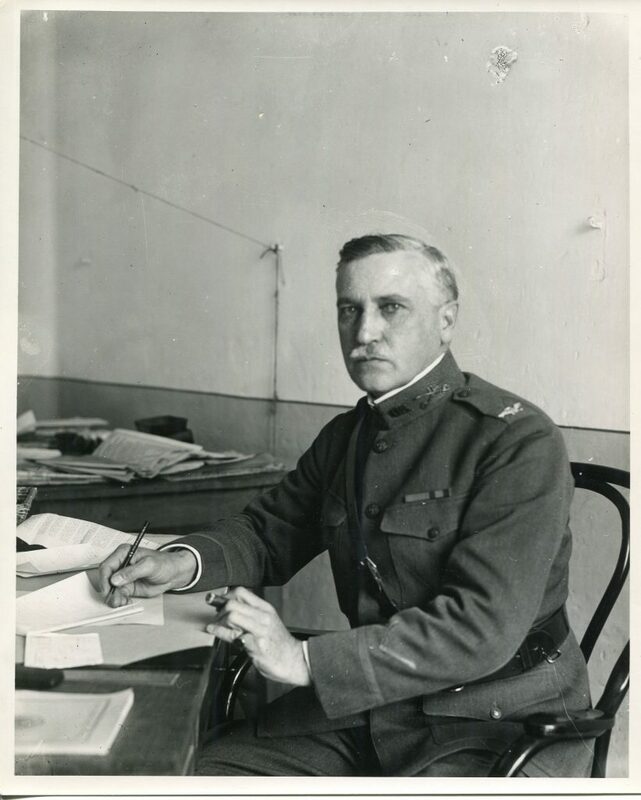 He had gotten word of the Army’s plan for the creation of a Tank Corps and, at the encouragement of his superiors, penned a letter to Pershing highlighting his qualifications for a position in the compelling new unit. Among these qualifications were his fluency in French, and the fact that he was the only American who had “ever made an attack in a motor vehicle.” This attack occurred during the Punitive Expedition of 1916 and resulted in the death of one of Pancho Villa’s key subordinates, Captain Julio Cardenas. Patton’s superiors saw promise in the ambitious officer and charged him with the task of establishing a tank school for the AEF. Before establishing the school, Patton needed to have at least a rudimental knowledge of tanks. Patton was sent to the French Light Tank Training Center at Chamlieu for a two-week crash course on the subject. The rigorous curriculum included: observing maneuvers, studying tactics, touring facilities, and hands-on activities such as driving tanks and firing their guns. 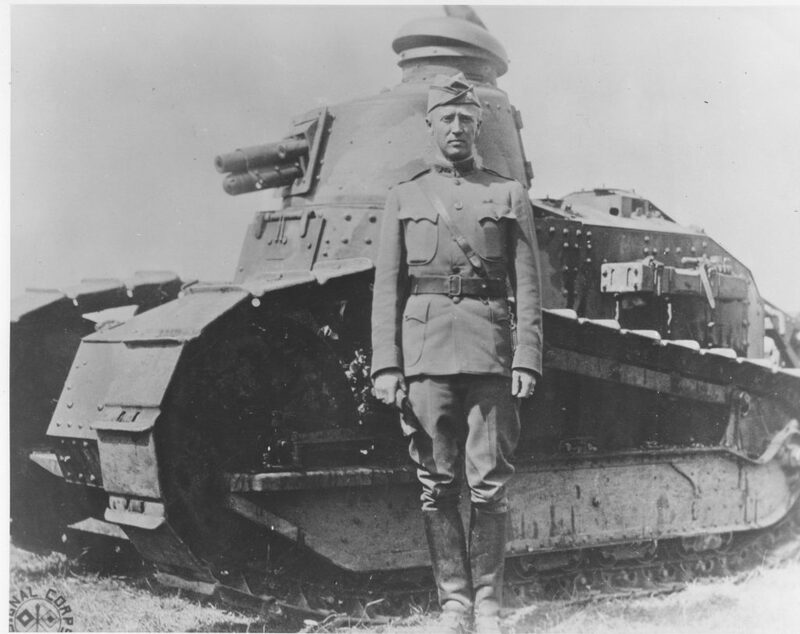 After leaving Chamlieu, Patton augmented his education with a visit to the Renault Tank Works at Billancourt. There Patton and his assistant, First Lieutenant Elgin Braine, came up with several ideas for improving the Renault, which were later acted upon, including alterations to the fuel tank and creating interchangeable gun mounts so that the tanks could employ either a machine gun or a 37mm cannon. After their intensive two-week education, Patton and Braine penned a thorough report on their findings that would prove instrumental in the Army’s integration of tanks. It included recommendations for organization, training, tactics, logistics, and seemingly anything else needed for the successful implementation of tanks by the AEF. When Rockenbach took command, the Tank Corps consisted of a mere three officers: himself, Captain Patton, and First Lieutenant Braine. It steadily grew as new recruits trickled in and it soon became a well-trained and cohesive force. In February, Patton established the light tank school at Langres and training commenced. Initially, the trainees had to make do without equipment crucial to their role in combat—actual tanks. Nevertheless, the industrious Patton did not let a mere lack of vital equipment stand in the way of progress. He developed “machine foot drills”—training exercises that could be carried out on foot but prepared the soldiers for signaling methods and drills conducted within tanks. The trainees were also instructed in the use of the 8mm Hotchkiss machine gun and 37mm cannons employed by Renault tanks. The doughboys even constructed plywood Renaults armed with Hotchkiss machine guns and equipped with rocking bases, so that soldiers could practice firing while navigating rugged terrain. When the first tanks did arrive on 23 March, Patton’s pupils learned to operate them with relative ease. The learning process for the drivers was however, not entirely pleasant. Due to the cacophony inside a running Renault, tank commanders, who sat in the turret above the driver’s compartment, were unable to communicate with their drivers vocally, so commands were conveyed physically—through kicking to be precise. If the commander wanted the driver to move forward, he would kick him in the back; a kick to either the left or the right shoulder indicated that the driver was to turn in that direction; a kick to the head meant that the driver should stop; and multiple kicks to the head meant that the driver was to back up. In addition to learning how to operate their vehicles, soldiers at the tank school also learned maintenance, map and compass reading, range estimation, and other skills. Concurrent to the establishment of the Light Tank School, Rockenbach looked to the creation of a similar institution for heavy tanks. In February, he contacted the War Department with the intention of recruiting personnel for heavy tank battalions. In response the personnel from 65th Engineer Regiment, located at at Camp Meade, Maryland, were allocated to a heavy tank unit. 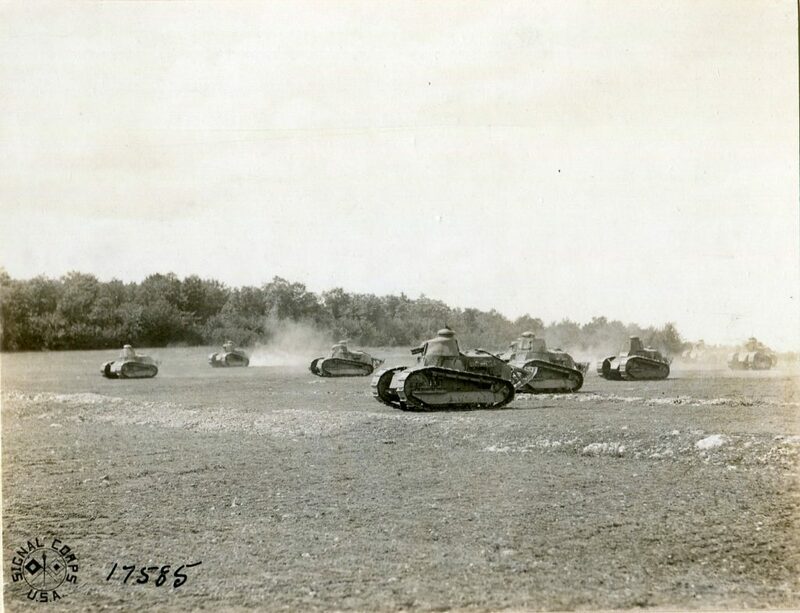 In addition, there was a barrage of enthusiastic recruits and in early April, the newly christened 1st Tank Battalion, later designated the 41st, and ultimately the 301st, had arrived in England for training, which began at Wareham and moved on to advanced training at Bovington. The training the troops received in England was similar to that at the Light Tank School in France: learning to operate the tanks, maintenance, signaling, and drills. 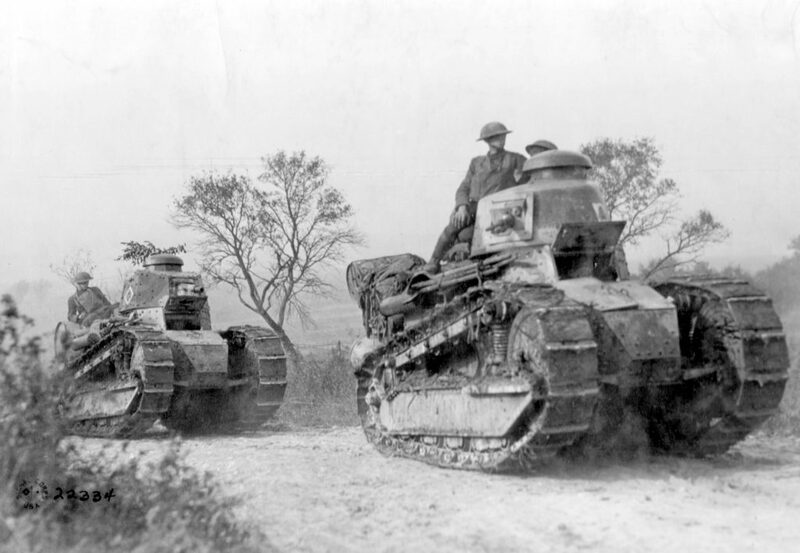 The heavy tanks the doughboys were training to operate in England were a much different beast than the light Renaults of their contemporaries in France. The Renault FT17 was 16 feet, 5 inches long, 5 feet, 8 inches wide, and 7 feet, 6.5 inches tall. It weighed 7.4 tons and was operated by a crew of two. Its offensive capabilities rested either a 37mm gun or 8mm machine gun. Although limited in armament, they were slightly faster and more maneuverable than the Mark V. In comparison, the Mark V was 26 feet long, 10-13 feet wide depending on the gender of the tank (tanks were identified as male or female depending on their armament; Male Mark V tanks were armed with two 57mm guns and four machine guns while females were armed with six machine guns) and 8 feet tall. An even larger version, which the 301st also ended up employing, was the Mark V Star. It was 32 feet long, 10-13 feet high, depending on if male or female, and 8 feet tall, carried an extra cannon or machine gun. Meanwhile an additional training camp was established on American soil on the former Gettysburg battlefield in Pennsylvania. The post was designated Camp Colt and put under the command of Captain Dwight D. Eisenhower. Training at Camp Colt was, by necessity, more rudimentary than that at its European counterparts. Initially lacking tanks, Eisenhower had to make due by training his men to drive on trucks. For machine gun training, he had machine guns bolted to the beds of trucks; trainees fired at targets on Big Round Top while on the move. A Renault arrived in June, but Eisenhower had to teach himself how to use it before he could train his officers; they in turn trained their men. Eisenhower’s ingenuity and superb running of Camp Colt would earn him a temporary promotion to lieutenant colonel in October, by which time Camp Colt was home to over 10,000 soldiers. The Army established four smaller Tank Corps training facilities at Camps Summerall and Tobyhanna in Pennsylvania, and Camps Greene and Polk in North Carolina. It should be noted that there were two distinct divisions of the Tank Corps: one was the Tank Corps, National Army (NA), under the command of Ira C. Wellborn, and the second was Tank Corps, AEF, under the command of Rockenbach. The Tank Corps, NA, was in charge of all tank activities in the United States, while the Tank Corps, AEF, oversaw tank activities overseas. Neither sharing any direct command relationship. The Tank Corps mediocre performance was more a result of bad weather, adverse terrain, and mechanical failures than enemy action. 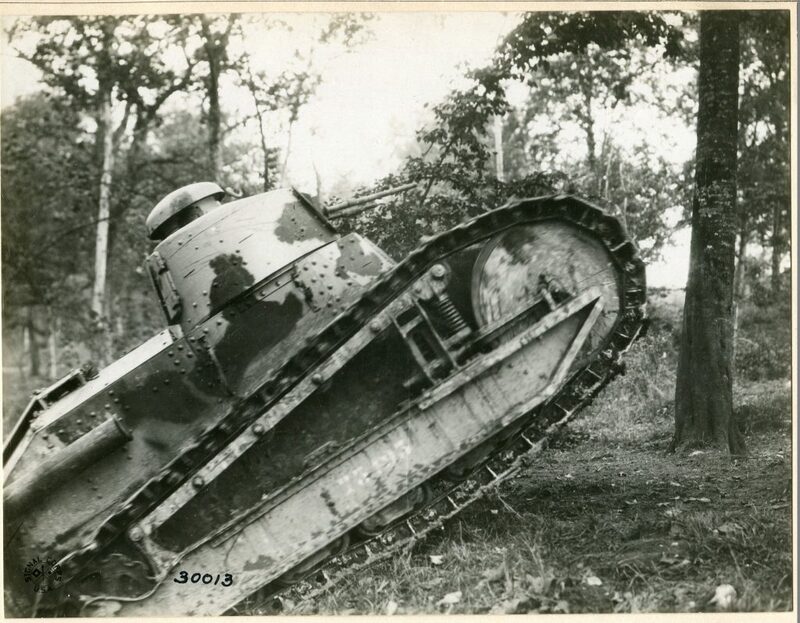 It had rained for several days prior to the attack and the mire caused considerable consternation as a number of tanks became hopelessly bogged down in the soppy French soil. The confounding maze of wide, deep, trenches the tankers had to traverse only exacerbated the issue. Major Sereno E. Brett, commander of the 326th Tank Battalion, was compelled to proceed on foot after having to abandon three separate tanks to the insatiable muck. This was far from an isolated incident—three of Brett’s company commanders were also obliged to dismount and continue on foot. By 16 September, forty of the tanks in Patton’s brigade were either bogged down in the mud or experiencing mechanical problems. Three more were lost to German artillery, leaving the brigade with 131 functioning vehicles. Despite these setbacks, the Tank Corps proved its worth numerous times throughout the battle. The tanks that remained in the fight put dozens of machine-gun nests out of action, aided in the capture of a number of towns, and took numerous prisoners. All of this was accomplished with minimal casualties—the 1st Tank Brigade lost five men killed, and nineteen wounded. It should be noted, however, that the Germans only put up a half-hearted defense at St. Mihiel, as the German High Command had decided not to hold the salient and some units had already begun to withdraw when the American advance occurred. The true test of the Tank Corps would come in its next action, the Meuse-Argonne offensive. Aimed at breaking through German lines by advancing through the Meuse-Argonne sector, the campaign began on the night of the 25-26 of September with a massive Allied artillery barrage. At 0530 on 26 September, the 344th and 345th Tank Battalions rolled out in support of the 28th and 35th Divisions, I Corps. The bulk of the two battalions supported the 35th Division to the east of the Aire River, while Company B of the 344th and Company A of the 345th supported the 28th Division to the west. Fierce resistance was soon met on both sides of the river, but the men of the 1st Tank Brigade were resolute. The 28th Division’s advance was stalled by heavy machine-gun fire outside the town of Varennes, leaving the tanks without infantry support. Unfazed, Captain Dean M. Gilfillan of the 345th Tank Battalion doggedly continued his attack. With his tank in flames after receiving two direct hits from artillery fire, and suffering a wound from an enemy machine gun, he managed to destroy two German machine guns and gun down a number of German soldiers before abandoning his vehicle moments before it exploded. Despite being subsequently wounded by shrapnel, he remained at his post long enough to witness a second, successful assault on Varennes. The 1st and 3d Tank Brigades, however, were not the only American tank unit to see action. On 29 September, the 301st Heavy Tank Battalion, under the command of Major Ralph I. Sasse, moved out in support of an advance on the Hindenburg Line along the St. Quentin Canal. The debut of the American heavy tanks proved even less successful than that of the light ones. Only one of the forty tanks that went in to combat remained operational at the end of the day. German artillery proved to be very effective, knocking out sixteen tanks. Allied artillery fired smoke rounds to mask the advance, but the wind quickly blew the smoke back toward friendly lines, causing the tankers to become disoriented and scattered. Furthermore, the advancing infantry bypassed many German positions, allowing enemy combatants to circle back and attack the rear of the tanks. There were also the ever-present mechanical issues. Nevertheless, the men of the 301st acted with coolness and determination. Many continued to fight even after the destruction of their tanks, dismounting their machine guns and continuing to pour fire in to the German positions. First Lieutenant John R. Webb, using only his pistol, single handedly dispatched a German machine-gun crew that was harassing his men while they dug their tank out of a ditch. The 301st Heavy Tank Battalion’s losses totaled twenty men killed, eighty-five wounded, and seven missing. It’s a mile to your objective now, but it’s a mile of thrills. You get shot-up, put out a half dozen machine-gun nests; clean up another sunken road with machine guns placed every ten feet along it. A one-pounder in a hedge scares you with several well-placed shots before it ‘goes west’ [is destroyed]. Some German artillery observer, way back, spots you and chases you over the landscape, dropping a shell, now in front, then in back of you. Here is your objective! You wait for the infantry to come up and your crew enjoys a breath of fresh air. Another successful assault, in support of the II Corps attack on German positions in the vicinity of the Selle River, occurred on the 16th. This was followed by an attack on German lines near the towns of Bazuel, Ors, and Catillion a week later, during which the 301st supported the British 1st and 6th Divisions. By now, the 301st had been reduced to a single provisional company of twelve vehicles. Despite minimal planning, the attack was another triumph for the 301st as they suffered no losses and reached all but two of its objectives. This, however, would be their last battle; the 301st was recalled from the front lines for repairs and, before it could return, the Armistice was signed on 11 November. While the tank had proved its value during World War I, the years following the war hailed a dramatic reduction to the size of the Tank Corps. By 1 July 1919, the Corps, which had peaked at 20,212 officers and enlisted men (counting both the Tank Corps, NA, and the Tank Corps, AEF) in November 1918, had shrunk to eighty-one officers and 213 enlisted men. By this time the very existence of the Tank Corps had come into question. While there was no argument as to whether the Army should continue to employ tanks, there was disagreement as to whether they should constitute a separate branch. 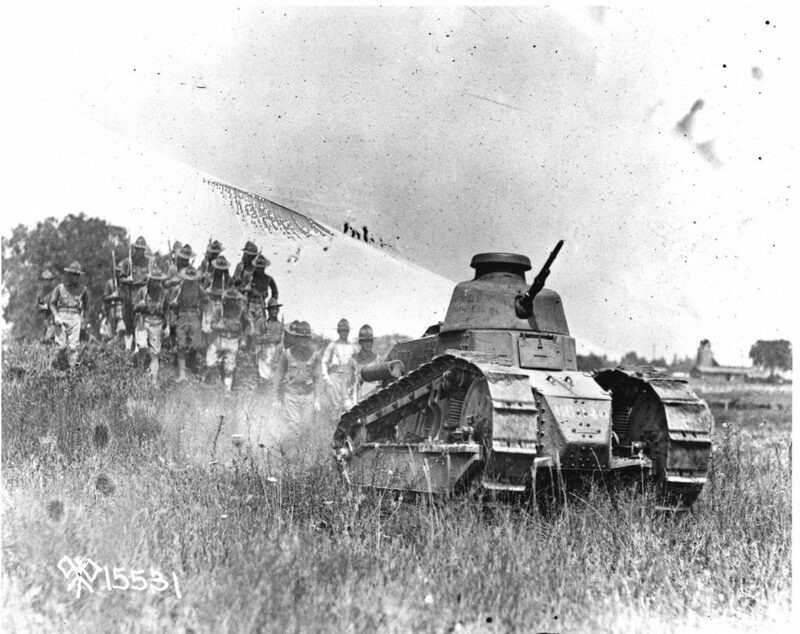 Eventually, a War Department Board expressed the opinion that the “Tank service should be under general supervision of the Chief of Infantry and should not constitute an independent service.” Despite protests from Rockenbach, Patton, and Eisenhower, the Corps lost its independent status on 2 June 1920 with the passing of the National Defense Act. This was due less to a lack of faith in tanks than it was to monetary concerns. American tank research, development, and doctrine, progressed slowly in the interwar years as tanks were simply viewed as implements for infantry support. The German Blitzkrieg in 1939 and 1940 exposed the glaring deficiencies in this train of thought, and Army maneuvers in Louisiana further discredited this opinion. As a result of new doctrine with regards to armored warfare, the Army established the Armored Force on 10 July 1940, and World War II soon heralded a new era for American tanks and armored warfare for former Tank Corps Officers like George S. Patton and Dwight D. Eisenhower.